It seems the chore of keeping your home beautiful is a never-ending task. Here’s the easy way to have the best-looking house in the neighborhood for an entire year. 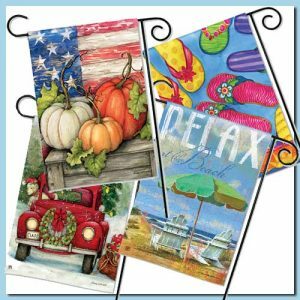 These coordinated, whimsical garden flags are perfect for posting by your mailbox, at the front stoop, in a flowerpot or – of course – in your garden. With hand-drawn detail and ultra-soft fabric, they give a distinctive appearance other flags can’t match. Thanks to the exclusive SolarSilk fabric from BreezeArt (which is 600 denier polyester) you’ll have no worries about mildew or fading. Blustery days aren’t a problem either: the heavyweight material sways nicely in the breeze without bunching. You’ll find a wide variety of garden flag bundles and a Make Your Own Bundle special at the Epiphany WOW store.